These extendable batons expand to either 16, 21, 26 or 31 inches with just a flick of the wrist. Holster Included. Choose your size! These extendable steel batons expand to either 16, 21, 26 or 31 inches with just a flick of the wrist. You choose which size you want it to reach out to. Conceals Easily Until You Extend or Flick it Out! 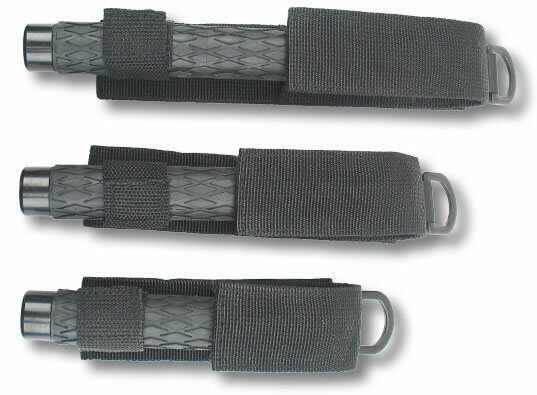 Expandable batons fit perfect on your belt or next to you in your car. If a bad guy wants to make trouble, you'll have something for them. A collapsible baton can be easily hidden and quickly extended for immediate use. Positive locking system. It will not collapse when you need it extended. It is best to get professional training to ensure you know how to use this self-defense product effectively. It doesn't take much to get this moving around in very effective techniques you can implement. 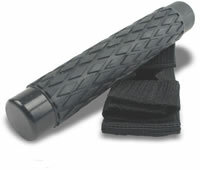 The expandable steel baton is great for both offensive and defensive techniques you would need to employ in a real-world situation. Most police officers in the US are issued telescopic batons in place of the old billy clubs. The included holster has a built-in belt loop to easily fit on duty rigs of security guards and other law enforcement personnel. The telescopic steel baton comes with a padded handle for easy gripping and a FREE heavy-duty nylon holster with belt loop for easy carrying. The holster has hook and loop closures to keep it secure. If you are looking for effective self defense with extra reach, the extendable steel baton is it. Tip: To close the police baton, strike straight down on an unyielding surface. What size collapsible baton should I get? To give an idea, I've used all sizes and the one that feels most comfortable to me is the 21 inch. I'm 5'8" tall and the 21-inch length seems to fit me best. The 26 inch and 31 inch feel a bit too long and the 16 inch is just a touch too short for me. This is just my personal opinion based on how balanced it feels for me and you may like the longer or shorter one for yourself. So if you aren't sure which size you should get, the versatile mid-size option is a solid choice. You may want the longer one so you have a further reach or the shorter one for your particular purpose. It really just depends on what feels right when you have it in your hand. You may want different sizes and place them in different locations. I keep one in my driver's side car door pocket in case of any trouble while on the road. If there's ever something that happens while in my vehicle, at least I know I can quickly have a self-defense weapon with me to defend myself or my family. 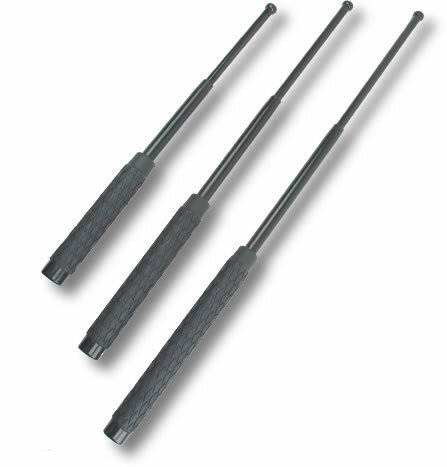 FURTHER DESCRIPTION: Telescopic Steel Batons are tubular shafts of steel made up of three separate sections. Each section gets smaller in diameter as you go further from the handle section. This allows the shafts to collapse into each other when you store the baton. When fully extended, the three sections form a rigid solid steel baton that gives you tremendous striking power. The tight fit between the shafts creates a friction lock that won't collapse on its own. The expandable baton has pretty much replaced the old billy club of law enforcement. They are smaller to carry, easy to employ, and are effective weapons both offensively and defensively. It is best to get professional training to ensure you know how to use this security baton effectively. Different sizes of the telescopic batons are the 16 inch, 21 inch, 26 inch and the 31 inch. Personal preference would guide your choice as well as your ability to wield the different sizes. This is where experience from training would help guide your decision. Though not a hard rule, the taller you are the longer the telescopic steel baton you could effectively use. The grip on the retractable baton is made of rubber, is easy to hold and will not slip out of your hand. These grips hold out much better than the foam grips. The foam grips wear down and will rip after a lot of use. The rubber grip on these telescoping batons last. Baton is perfect in my profession. Right size, weight and length. Great alternate for a self defense weapon. I build powerlines for a living and can't exactly carry my pistol with me at work. The majority of our jobs require us to go onto people's property to service a power pole. We never know when we could be met by a guard dog or heaven forbid a combative home owner. I went with the 21" baton. It's a pretty solid piece of hardware. And I had to support a local florida company. Thank you guys! I am 5'11" and the 21" Baton seems to be the perfect length for me. The plastic grip feels much more comfortable and secure than the foam grips I have tried. Shipping was quick.